Welcome to The Fringe Hours launch party! With less than one week until the release of The Fringe Hours, the party continues with another incredible giveaway. Today’s giveaway from ePantry is one of the largest I have ever offered here on The Mom Creative and I can’t wait to bless one of you with it. 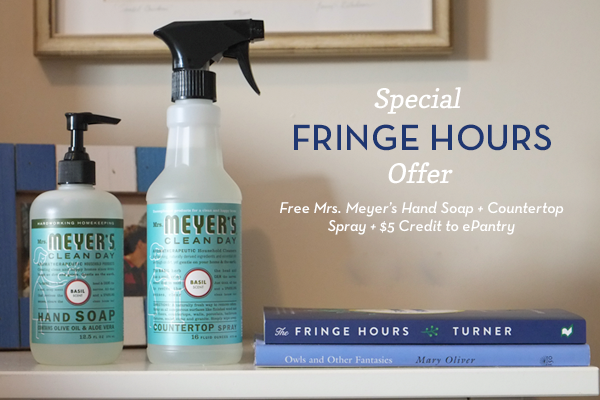 The best part is that even if you don’t win the big prize, ePantry is offering free Mrs. Meyers gifts for everyone – YEOW! Read on for details. 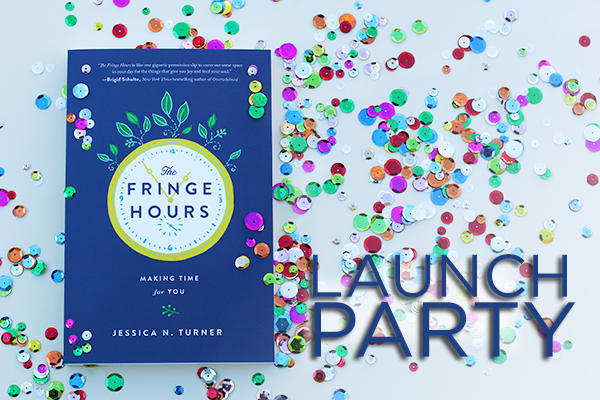 This launch party is a celebration of you because frankly, without you, there wouldn’t be a Fringe Hours . The idea for the book came because so many of you have written and asked about how I make time for my passions. It then grew into so much more because thousands of you responded to a survey about how YOU spend your time. 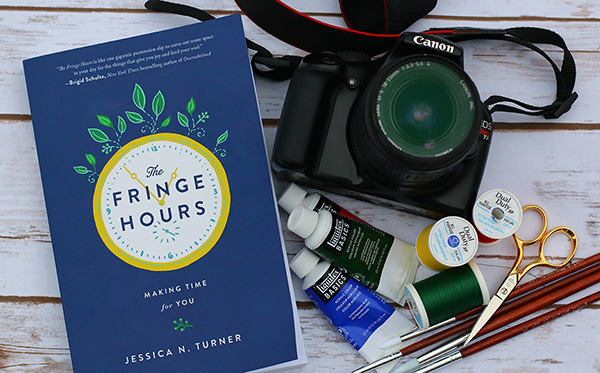 I couldn’t be more proud of The Fringe Hours: Making Time for You . It contains a life-changing philosophy that can impact any woman – married, single, kids, no kids, working professional, SAHM. It’s honest, practical and useful. We all need fringe hours. We all need to practice self-care. 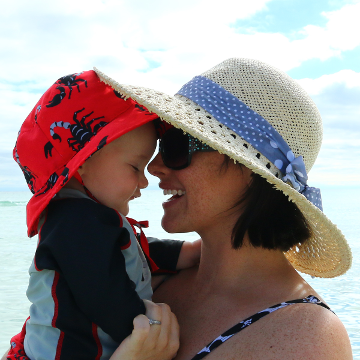 I am so grateful for all the ways you show up here on The Mom Creative. Your comments, your clicks, your emails. They don’t go unnoticed. I love you and I wrote this book is for you. Thank you for being such an important part of this community. I hope you are blessed by this fun series of giveaways, starting with the amazing one below. Part of seizing fringe hours is being wise with how you spend your time. That’s where ePantry comes in. ePantry is a fantastic site that allows users to have commonly purchased household goods sent right to you. I love ePantry because it saves me time by not having to go to the store – giving me fringe hours to do the things that I love. It also saves me money because on average, ePantry customers save 26% vs. their local grocery store. I can’t express how much I love ePantry. If you haven’t tried them before, this is the perfect opportunity. Head over to ePantry and sign up for a free account, then answer the 4 multiple-choice questions about your household and cleaning needs. 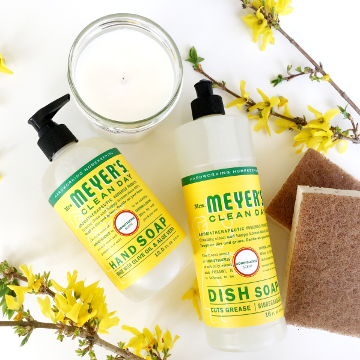 Check out the pre-populated cart (filled with some of my favorite products, including the two free Mrs. Meyer’s products) and make any changes you want. Do a happy dance that you saved time and money! This offer is valid today through February 20, 2015. So enter to win the year’s supply of products using the Rafflecopter, then go place your first order with ePantry. And if you would like to help with the launch of The Fringe Hours, check out the simple list below. Please know though, it’s not required for the giveaway. 2. Sign up for our launch week call: On February 18 at 9 pm EST, we are going to have a special call to chat about the topics in The Fringe Hours. 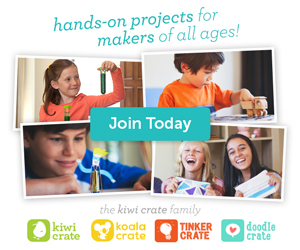 What’s awesome is that you can join in the fun without having to leave your home. With having a newborn, I promise I will be in pajamas. It’s totally free – sign up here to join in live and/or to get the link to listen after the fact. 3. Tell your friends about The Fringe Hours: Anything you can do to share about The Fringe Hours with your community makes a difference. We have beautiful pins/instagram images, tweets and more here. You can also Instagram how you are making time for you with the hashtag #FringeHours. I check the feed every day and love seeing glimpses of your lives. Of course, if you don’t have time to do any of these things, no worries! 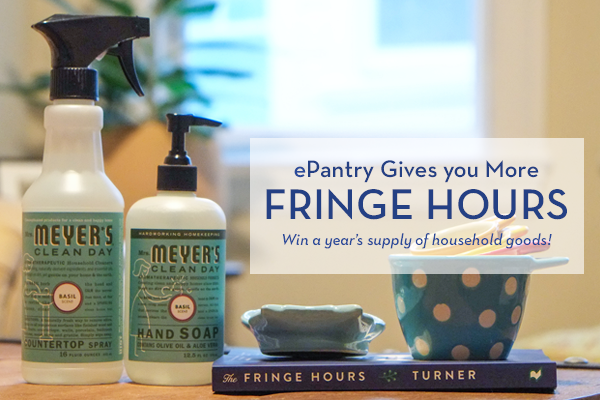 Still be sure to enter this incredible ePantry giveaway below. One winner will be chosen and added to this post on February 21. I love to read blogs! Yesterday for my Fringe Hours I painted. I pulled up a picture, got my canvas and while the kids played, I painted. 🙂 I’ve been reading the book. Love! Thanks for the chance to win! This would be so helpful! With 3 kids fringe hours are hard, but I do try to make time. Read, create new things, or play games. Relax with a nice cup of tea and a good book. So excited for the self reflection that this book caused me to do! Honestly? Sit and breathe in the quiet. I have been challenged by these posts. i made a chore chart for my kids so they could take over some of my cleaning and I had more time to do something creative!! I love to read, knit, and do project life in my free time. I am patiently waiting for my book to get her so I can read it! So excited for this book and “movement” in my life. I waste a ton of time every day and with the gentle reminders I am finding ways to use those minutes and sometimes even hours, so much more productively. Now that doesn’t mean I am cleaning more, cooking more, serving more. I am taking time to read, organize MY spaces, complete LOAD215 (a scrapbook layout every day in February). I am happier and that translates VERY well for my family. My favorite thing to do in my fringe hours…read. I have so many books, devotions, etc. that I seem to never have time to read – including the Bible. I also love to paint, draw, craft but have not figured out how to make more time for that. Hopefully this book will give me some ideas!! Ideally, I love to read, knit and crochet. More often than not though, I don’t allow myself to get started with any of those things (not sure I would be nice about putting it down to take care of life you know?) So I tend to play words with friends, solitaire etc. Perhaps, if I did give myself permission, to do more than games it wouldn’t be quite so hard to set it aside after an hour or so…. Read , write, and photography! I love gardening and blog reading. 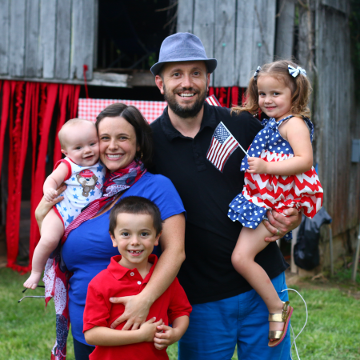 I homeschool 4 kids and my husband and I both own our own businesses. My business happens to fulfill my creative side, so during my fringe hours, my favorite thing to do is sit in the hot tub and catch up with hubby! I just told my sister-in-law yesterday about how I was using ePantry and Amazon Prime Pantry for so many household and some grocery products … and how I loved that it gave me more time at home to do what needed to be done there and what I wanted to do. Sums up #FringeHours right there! 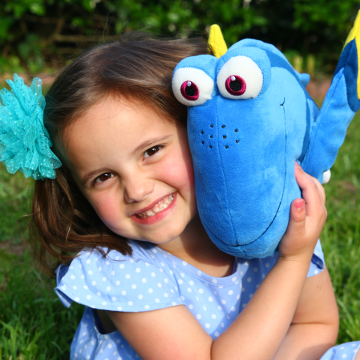 So it’s fun this is your giveaway today – what a fabulous prize! In my #FringeHours, I like to read or scrapbook. Read just for fun : ) It doesn’t happen often in our current phase of life, so I love when I can make time for it! I love to read, knit, and do project life during my fringe hours. I am waiting patiently for my book to arrive! I can not wait to read it! I love to read, knit, and do project life during my fringe hours. I am waiting patiently for my book to arrive. I can not wait to read it! i love a fun sewing project – rare, but rewarding when I make time for it. Thanks for the awesome giveaway and ePantry offers! I love to scrapbook or craft! My fringe hours — are my loves too many or my hours too few??? I’ve gotten good at squeezing in reading or crocheting when I have a spare minute. My favorite thing to do is READ! I got in the mail, like the Pottery Barn catalog. I need to make this kind of time more intentional in my day. I can’t wait to read The Fringe Hours! Read, read, read! (With a coffee alongside is even better). I recently tried to pick up crochet again but with every row I kept decreasing my stitches and got discouraged so set it aside for a time with more fringe hours to remember how to do it. I love to read and my new adventure is quilting! I am really enjoying it! I love to cross stitch. Does sleep count? In all seriousness, I’m a maker, so I love to create! My favorite thing to do in my fringe hours is read…and take a bath…or both together! Would love to catch up on some of the books I’ve stock-piled, work on the scrapbooks for my sons, and play around with some furniture painting. I am so excited about your new book, Jessica! Thanks for all the great info on your blog and fun giveaways! I love to read, sew, take pictures and scrapbook in my fringe hours. Great giveaway! Thanks for the opportunity…. I love to read, do Project Life & try new healthy recipes! I love to read! And sew, when I’m not wiped out! Your book looks so interesting!! Thanks for the giveaway! I love the Meyer products. I love to read when I have extra time; plus maybe a little bit of scrapbooking. I love to read, surf the web, and craft with my kids in my fringe hours. My absolute favorite thing to do is….READ. 🙂 With a 3 year old, I don’t get to spend as much time doing that as I would like. I like to squeeze reading into any moment I can! 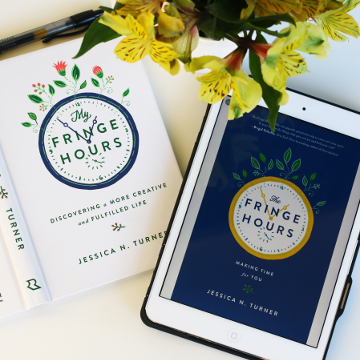 I am not sure what “fringe hours” are Jessica. Sorry. I am very much looking forward to reading your book and doing another bloom book study with you and Angie. (sniff, sniff) Sad to hear you lovely ladies are stepping back from the book club but totally understand. I love to read during the little free time I have. I want to take the time to do FUN stuff for me! Not shopping for household items, cleaning, etc. 🙂 And not waste the free time that I do have and probably don’t realize it. I love to catch up with family & friends online, and watch movies! I like to watch on of my favorite shows, hang out with my hubby or create something. I love to read and craft!! I love to read and work on digital photo albums during fringe hours! I’m really excited for the release of your book! Curl up with coffee and a good book! I’ve read many of your recommendations and never been disappointed! reading! and I really want to get back to sewing! I’m excited for you; I’d love to read this book! And the giveaway sounds great, too! I like to read and to go on walks outside when the weather is nice during my fringe hours. Read and do some crafting. I love to work on memory keeping projects. I love to take 20 minute power nap in the afternoon while the kids are resting. It gives me more energy for my family and other Fringe Hours activities. In my fringe hours I love to read, or browse Facebook for family news and pics, and I hate to miss my 1 yoga class each week. I feel so much better after yoga! I love reading and crafting in my fringe hours. To read and learn about many things including photography, nutrition, diy projects, and eyecandy blogs. I love sewing and baking gluten free goodies in the fringe hours, few and far between, but treasured moments to savor. Create – cards, scrapbook, wreaths but I have to say napping is a close second! 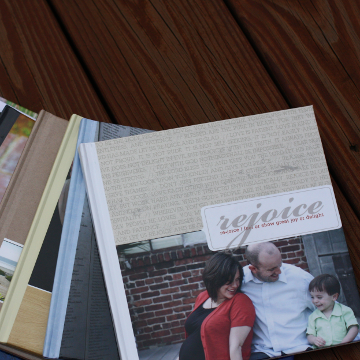 I love to bake and read and blog and create digital photo albums! My favorite thing to do with my fringe hours is read by the pool! I follow on You Tube as Birdie Bee (I made an error in typing). Making pretty things with sewing and crocheting or reading! I love to read and craft…definitely working on making more time for both! i love to read and draw. I love to scrapbook, read, and cook. Definitely read – books or blogs! I just bought an old (as in over 100 years old) house and so my fringe hours are spent with fun house projects. Thankfully I actually enjoy these types of projects – painting, sawing, sewing, decorating… I burn through fringe hours like they are going out of style. I like to read and look up different places to visit on vacation. I love to read a good book or bake sweet treat for friends and family! go for a run outside! Cook and Read! I have ordered your book – now the goal is to find the time to sit and read it! What awesome products! Thanks for the giveaway opportunity! I love to read or soak in the tub. I love to read, and to rubber stamp! I love to read and I would like to do more pinterest-inspired crafts for the house. I have so many things that I love to do in my fringe hours. Sewing, quilting, making jewelry, stained glass. I try to take advantage of those 5 and 10 minute spans. The little things do add uup. I’ve started crafting again, and I love it. I sew during naptime, knit while my toddler is plying (because it’s the easiest to put down and pick up again) and if I’m not exhausted after bedtime, Im learning to spin. I read cooking blogs and lots of recipes, and explore new ethnic foods and spices.